NOTE TO READERS: Beginning with the Monday cable post this afternoon, and for the rest of the week, charts will be posted as usual, but text (and responses to Comments) will be much delayed if they appear at all, due to our Sundance coverage. NETWORK FINALS: ABC’s NBA game adjusted to 1.2. 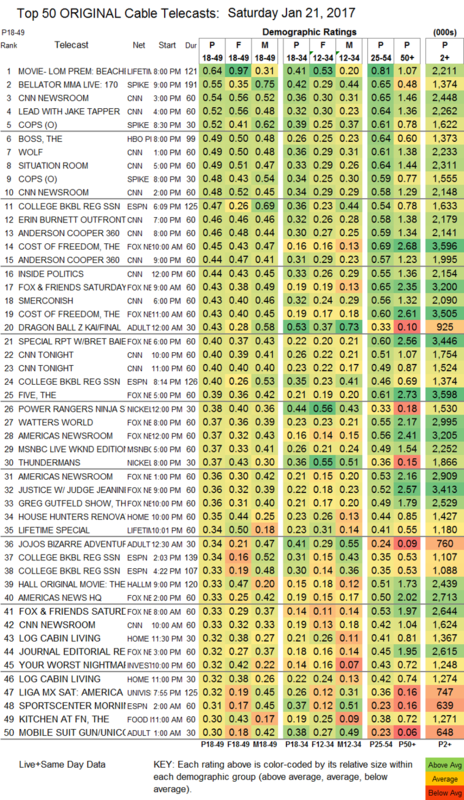 CABLE HIGHLIGHTS: The top 2 Saturday cable telecasts were at demographic extremes, with Lifetime’s remake of BEACHES topping 18-49s with 0.64 and dominating with women (an AFTER-SHOW was at 0.34), while Spike’s BELLATOR LIVE was at 0.55 with 18-49s and the heavy favorite with men (preceded by COPS at 0.52). Coverage of the Women’s Marches throughout the world boosted CNN, which had 5 of the Top 10 telecasts, led by the 3PM hour at 0.54. (In the reverse of Inauguration Day, Fox News lagged in the 18-49 demo with 0.45 for its highest hour, although it continued to lead in Total Viewers at 3.6M vs. 2.4M.) ESPN’s early evening COLLEGE BASKETBALL game, featuring South Carolina vs. Kentucky, was at 0.47. Note that we don’t currently have those Adult Swim shows listed by Nielsen as reruns, but DRAGON BALL SUPER plunged three-tenths to 0.28, DRAGON BALL Z was down 0.14 to 0.43, JOJO’s BIZARRE ADVENTURE was down a tenth to 0.34, and MOBILE SUIT GUNDAM fell 0.08 to 0.30. HGTV’s HOUSE HUNTERS RENOVATION rose 0.07 to 0.35. On Food Network, KITCHEN AT FN lost 0.08 to 0.30, TRISHA’S SOUTHERN KITCHEN was down 0.08 to 0.24, and PIONEER WOMAN dropped 0.16 to 0.23.